A ribbon cutting took place last week at Munchkin City Day Care in Middleport. Pictured are owners Serena and Josh Larsen, along with daughters Saelym and Anna, and Munchkin City employees Ashley Johnson, Jennifer Richards and Madison Hendricks. That is the motto for the new Munchkin City Day Care which opened this week in Middleport. Owned by Serena and Josh Larsen, Munchkin City provides both state and private pay funded daycare services to children age 1 and older. In addition to Serena Larsen, Munchkin City employees include Ashley Johnson, Jennifer Richards and Madison Hendricks. Hours are currently 7:30 a.m. to 5:30 p.m., but Larsen stated additional hours may be added if there is enough interest. She emphasized that when filling out the application, parents should state specific days and times needed (such as Monday until 7 p.m. or Saturday 8 a.m. to 1 p.m.). This will allow for a decision to be made regarding additional hours. The center is divided into a room for ages 1-2, an area for ages 3-4 and an area for after-school kids. There is an outdoor fenced in play area, as well as indoor play space, and craft and music area. Buses from both Meigs Local and Carleton School stop at Munchkin City after school to drop off children for after-school care. There are openings still available, as well as drop-in care as space permits. Those interested in more information, or to apply, call 740-416-9004 or email munchkincity123@yahoo.com. Applications are also available on the fence outside of the building located at 584 North Second Avenue in Middleport. 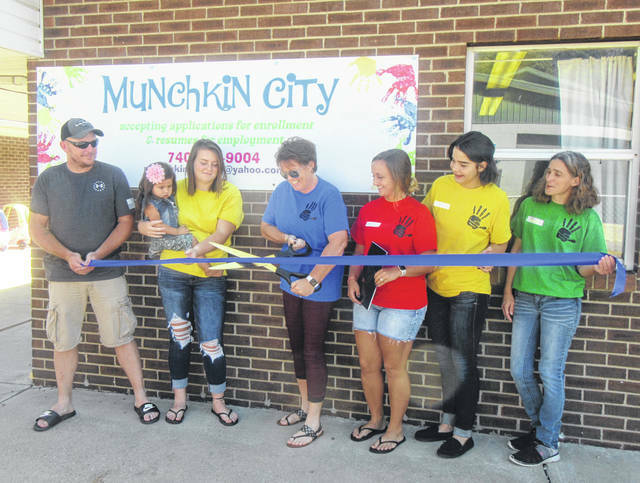 https://www.mydailytribune.com/wp-content/uploads/sites/42/2018/09/web1_9.20-Munchkin-City_ne2018919122154683.jpgA ribbon cutting took place last week at Munchkin City Day Care in Middleport. Pictured are owners Serena and Josh Larsen, along with daughters Saelym and Anna, and Munchkin City employees Ashley Johnson, Jennifer Richards and Madison Hendricks.